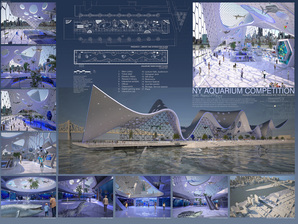 NYC Aquarium aims to lead the waterfront free from the capitalized city, presents in low-building-profile but stand as a liberty of culture and public commodity against the capitalist. A bridge direct towards FDR. Memorial Park and Headquarters of United Nation, link to meaning of uniting the people fight for new liberty. 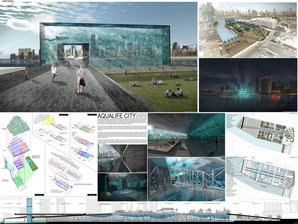 The aquarium is a microcosm of NYC, seeing the same patterns reproduced from the city scale down to the aquarium, which allows the people sensitively linked to the city while walking within the aquarium, and creating the awareness by showing the beauty and ugly of the water life. This project seeks to explore the relationship between the experience of moving underwater and the sensation of surfacing and walking. The occupant begins in a chamber surrounded on all sides by aquatic life, compressing the main circulation and encouraging a path of movement similar to a school of fish in a strong current. The walkway inherits the form previously used the aquatic displays, as the center now houses a constructed ecosystem of saltwater life, where the curvature of the glass creates the illusion of staring into the depths of the ocean, with a faint silhouette of the urban environment beyond. The building’s architectural trend was defined and shaped from the other buildings surrounding it to be familiar. 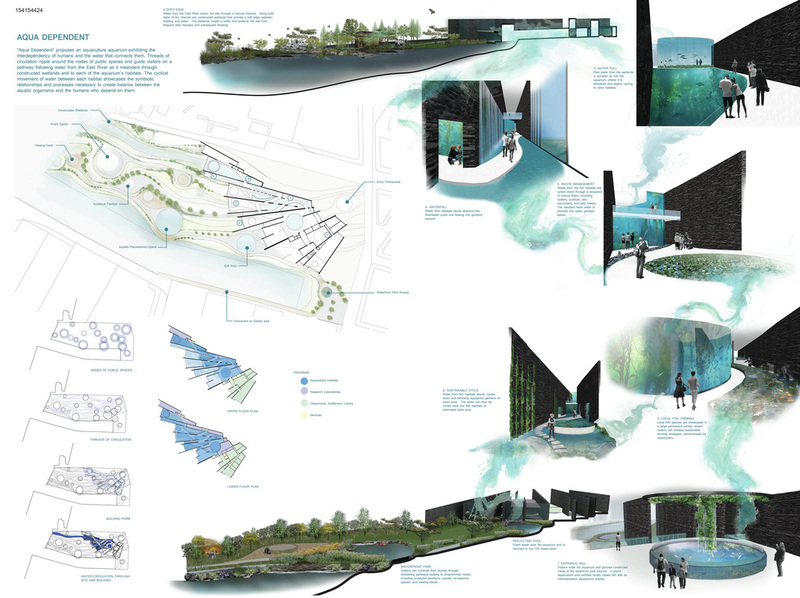 One of the main concerns of the project is how to link the Aquarium with the river and not to have a segregation between them. 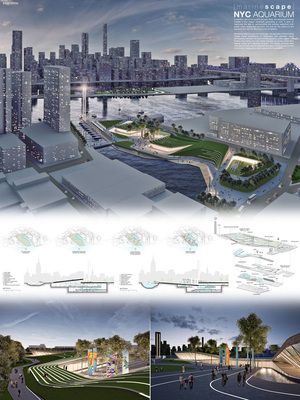 The three masses are inclined from the upper point of the roof to the lower point of the ground and green roofs are found above them to be a part of the landscape so the building will not be an obstruction to the view of the river. Glass windows are found in the interior of the building to link between outside and inside. Visitors enter tunnels surrounded by water to reach maximum limits of reality and also they will found skeletons of water species with their real scale. In an environment owned by private developers, the building creates connections between the pedestrian and the urban context to generate useful public space that has a visual dialogue with the place. The project responds to a new typology by breaking an inside learning experience of aquariums by proposing three salt marshes that serve as educational public spaces and as a system of water control that creates a new micro ecosystems for local plant and animal species. 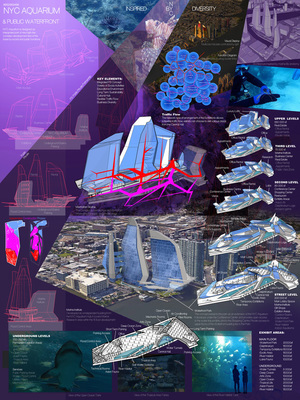 Inside the building, the user encounters a system of ramps and passageways that change from floor to floor and tanks that introduce new ways to experience underwater environments. The aquarium contains native marine species and associated animals, in an effort to help the wider waterfront regeneration. Incorporated rooftop parks provide spacious social areas for the community and visitors, protected by an overhanging roof structure influenced by the movement of water. Cube structures are submerged/raised to create protected lagoons, adaptable to any size as required. Lower levels act as viewing tanks and exhibition spaces for the public or private research facilities. If needed multiple cubes can be connected, creating larger spaces. 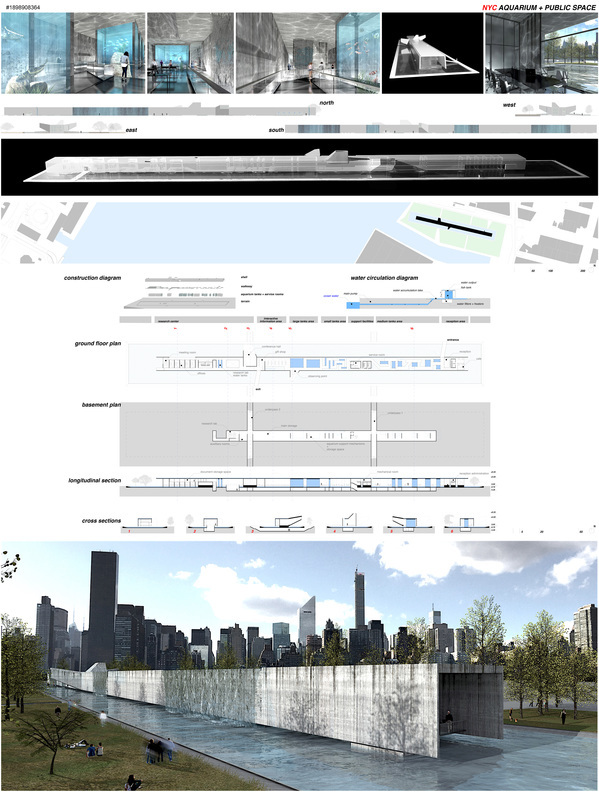 An ever evolving and fluctuating topography reflects the typology and environmental needs, as a natural landscape does. 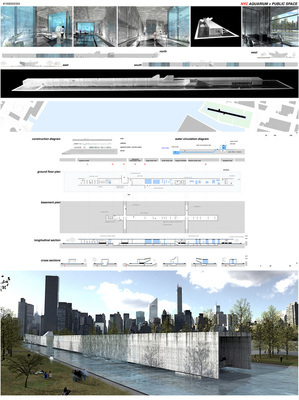 Located in one of the world’s densest cities, the proposed building creates a low impact landmark generating a void. 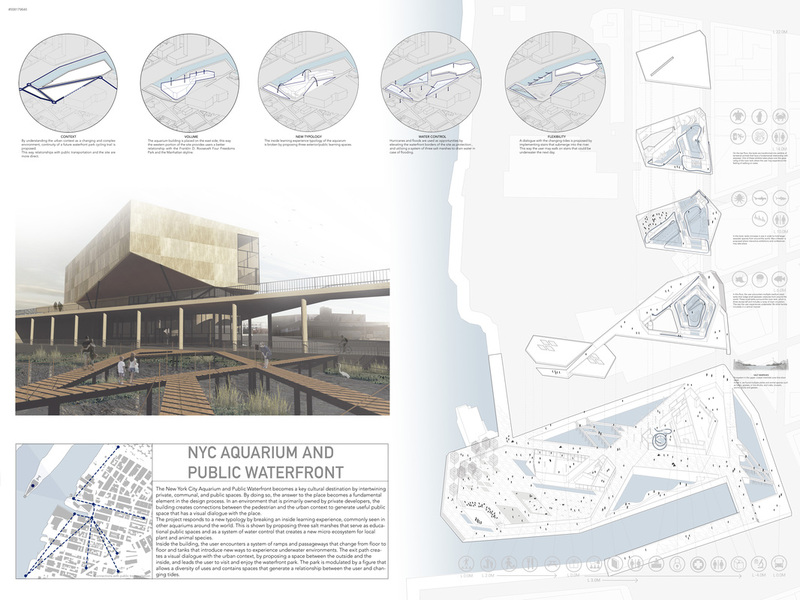 It aims to reactivate the site by reinterpreting the existing waterfront with public urban space and activities, not only for the visitors of the aquarium but also for the community of Queens. Revealing itself through the landscape, the gestures of the building create visual connections to Manhattan and generate visual permeability between the park and the aquarium. The design provides NYC not only with an aquarium but also a meeting point for the community, merging the public space with the building. 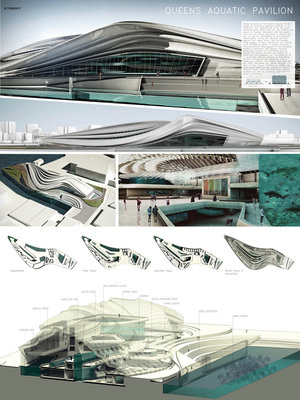 The building consists of a skin structure that envelops the entire interior circulation and the tanks. This strategy allowed for formal freedom which was inspired by the mechanical properties of water; specifically wave behaviors. By using large tanks, we have designed our circulation to be a continuous pathway that constantly provides cross platform visual connectivity. In addition large tanks are more efficient in terms of energy consumption, maintenance and upkeep of the biological habitats. 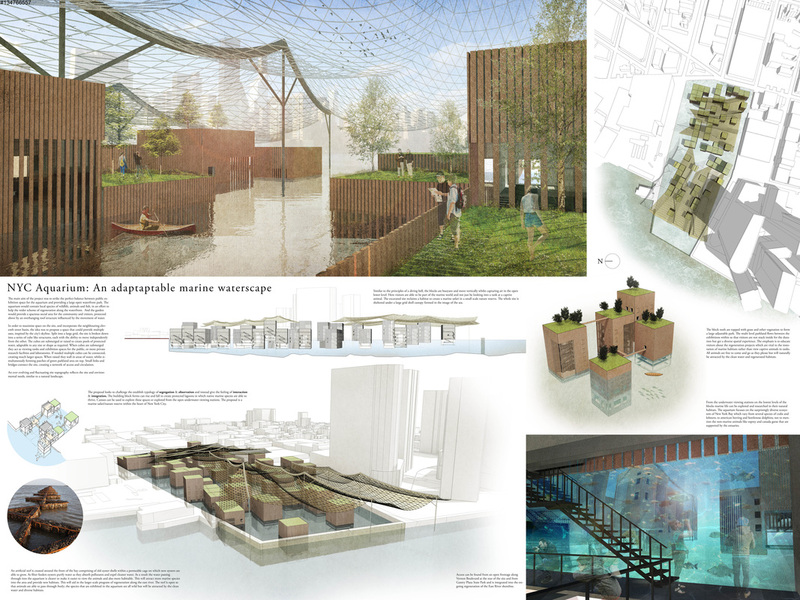 Furthermore they provide healthier social environments by communal, diverse ecosystems for marine animals and plants. 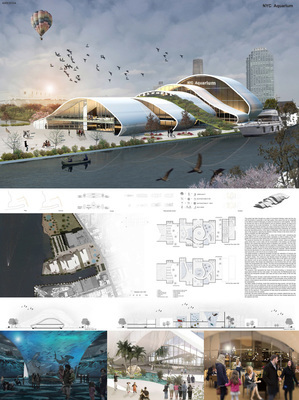 The building is composed of a wavy roof animated along east west axis. 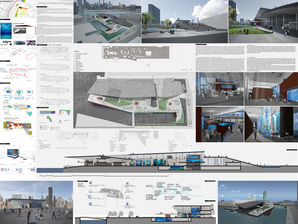 The roof is a single element interconnected by hexagonal modular parts interlaced to each other floating above rectangular planes and floor levels. The upper plane or the first level is interrupted by irregular giant craters that reveals the aquarium tanks below. the voids connect visually the two levels and filters sun light below. The main level connects to the plaza and is dedicated to the research library and hands on exhibit, and interactive discovery. The city of NY backdrop was a must keep feature of the aquarium. 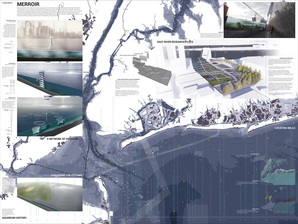 The project aims at investigating the theme of fluidity between indoor and outdoor spaces through a network of paths intended to discover the marine world. 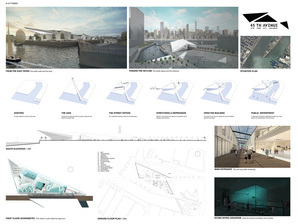 A building in which the space expands and contracts in a series of volumes hosting different water tanks, conceived as cavities inhabited by a variety of fish, in a succession of light glimpses and dark surroundings. Design solutions such as the permeability of the roof, the wooden opacities of the cavities hosting the different biotopes and the wide transparencies of the shell make the whole architecture penetrable and permeable, exactly like the marine world. 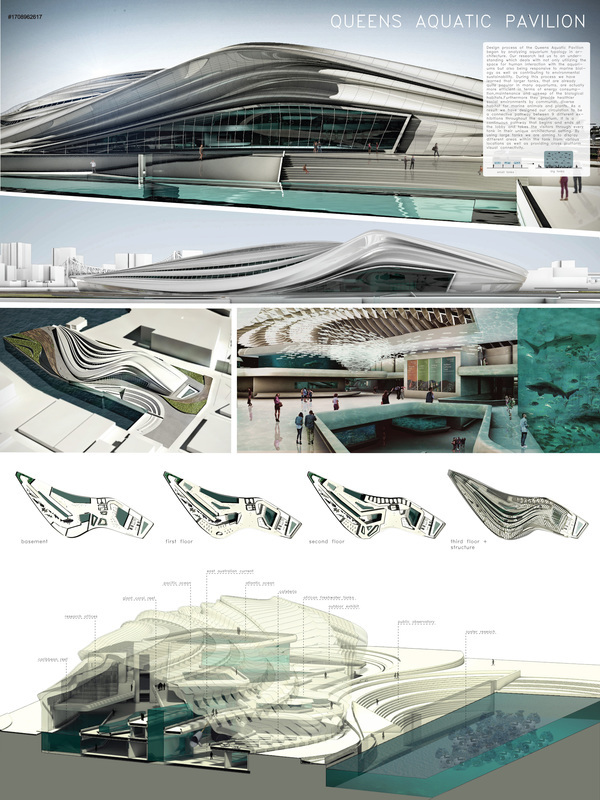 “Aqua Dependent” proposes an aquaculture aquarium exhibiting the interdependency of humans and the water that connects them. 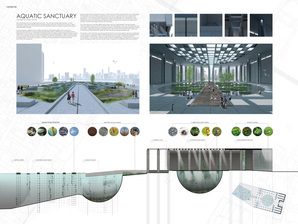 Threads of circulation ripple around the nodes of public spaces and guide visitors on a pathway following water from the East River as it meanders through constructed wetlands and to each of the aquarium’s habitats. The cyclical movement of water between each habitat showcases the symbiotic relationships and processes necessary to create balance between the aquatic organisms and the humans who depend on them. The project creates a place of connection between water and the city, generating a new high quality urban space integrated with the difficult context of belonging; It’s a flexible space that lends itself to holding multiple recreational activities and raises awareness towards the environment. 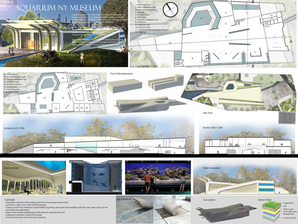 The aquarium becomes the new element in a broader context here we designed green areas that in some cases will be incorporated in the building and outside they become areas of relaxation. 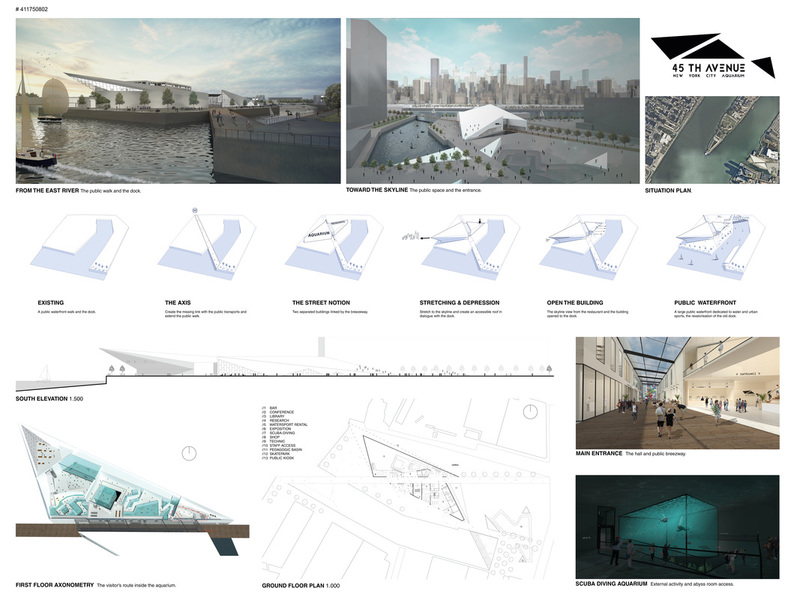 The new spaces will be integrated with the waterfront, designed in continuity with the existing one. 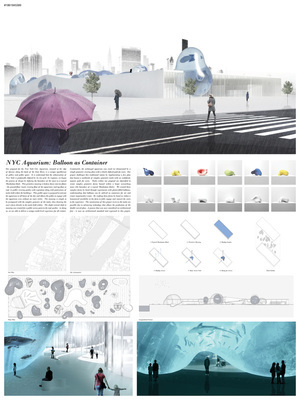 The spatial flexibility is designing by modular elements. 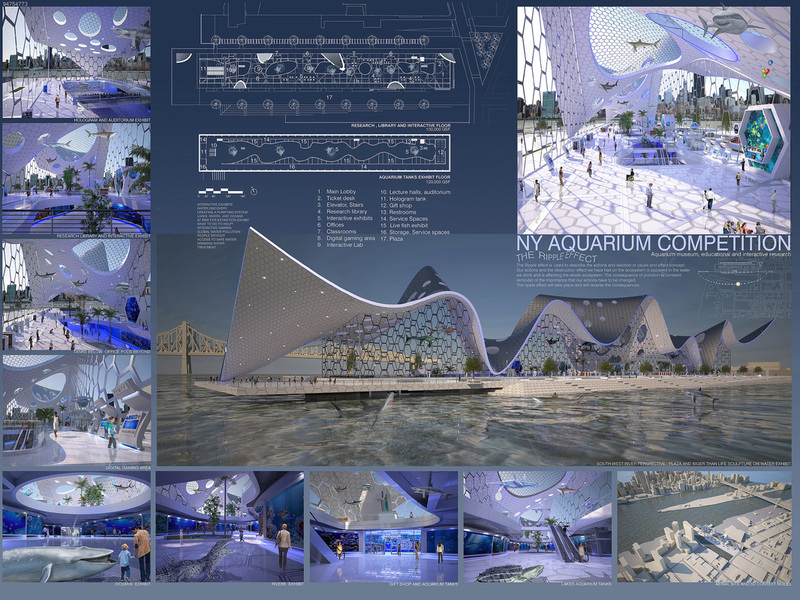 Our proposal for the New York City Aquarium is a unique equilibrium of aquarium and public space. This public space is purposed to activate the aquarium at all hours of the day and allows the public to engage with the aquarium even without an entry ticket. Customarily, the archetypal aquarium was [and is] demarcated by a simple geometric viewing glass with a clearly defined path for users. Our project challenges this traditional notion by implementing a free plan that houses a multitude of complex geometric tanks with an undefined, organic path for users. This is the intersection of aquarium with sanctuary. A typical aquarium displays exotic marine creatures in a tank behind glass which constructs a disconnected experience, keeping human separate from animal. However, we are an integral part of the ecology of this earth. 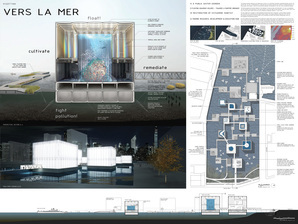 Our project seeks to create an interactive experience where visitors can be immersed among marine life to satisfy an intrinsic desire to be connected with the aquatic ecosystem. Thus, not only are we reminded of how interconnected and dependent we are on our natural environment, but how our lives and wellness improve and are enriched by this awareness. The axis is the main purpose of the project. 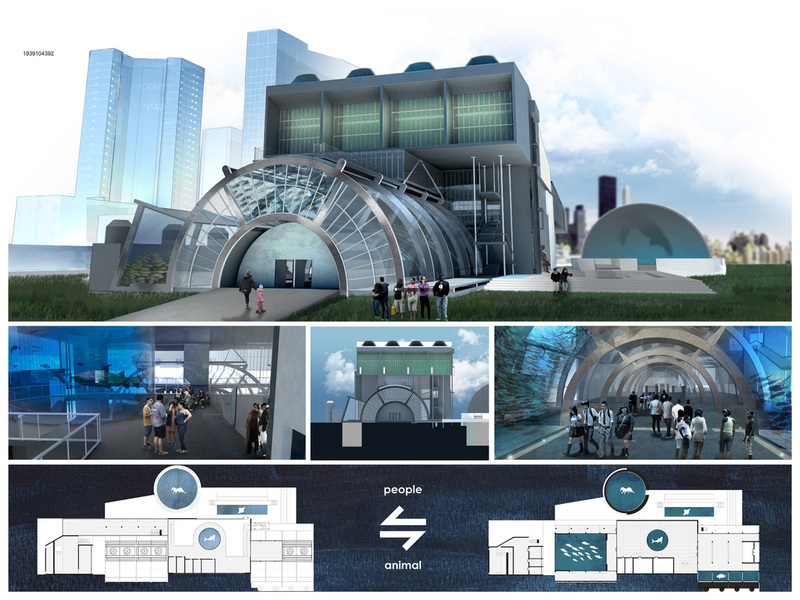 The aquarium, brings the visitor through a relaxing route made of turnarounds and pauses. The central basin brings an external activity with scuba-diving. The visitor goes down along the basin to reach the abyss room. The route ends with the large sharks room and a last ascent to the restaurant and the Manhattan skyline view. The bar, library, conference hall, research and rental are opened to the dock dedicated to water sports. The kiosks creates urban furniture for the skaters, also provides a seat and sensibilisation on the public space. 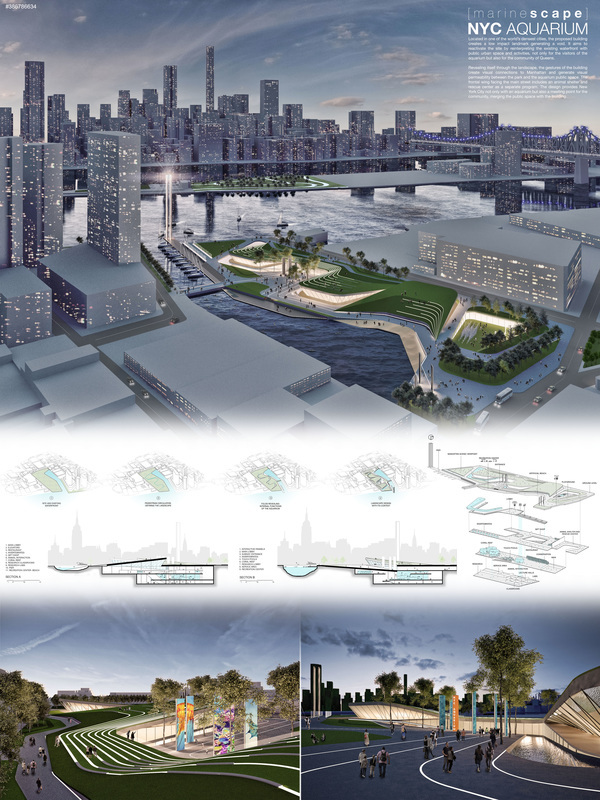 Considering the NYC socio-economic environment, the Project is designed as P3 (Public Private Partnership) integrated rather than a single destination site, providing a viable solution to current challenges, including future government/private real estate developments opportunities. 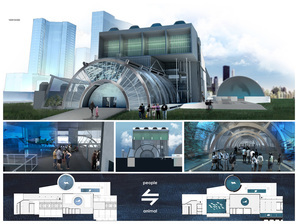 The Aquarium would span from the underground parking level, to a variety of fish habitats that are exposed on the multilevel inter-connected hubs (tropical, lake, river, artic), then to the upper level promenades and shopping centers. Resembling a fish’s anatomy, the complex access ways will include public and private views, and high-rise buildings.Construction phasing is strategically planned for smart operations and cost efficiency. Enjoy!